Aquatic hypercarbia, either naturally occurring or anthropogenically induced, can have extensive impacts on aquatic environments and resident organisms. While the impact of acute hypercarbia exposure on the behavior and physiology of fishes has been well studied, relatively little work has examined the physiological impact and acclimation capacity of fishes to chronic hypercarbia. To better understand the impacts of prolonged hypercarbia exposure, largemouth bass were held at ambient CO2 (13 mg L−1) and elevated CO2 (31 mg L−1; ≈21,000 µatm) for 58 days. 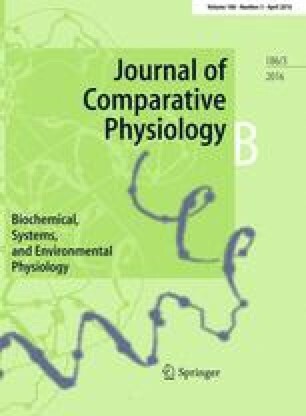 Following this acclimation period, fish were subjected to three separate, yet complementary, experiments: (1) acute hypercarbia challenge of 120 mg L−1 CO2 for 1 h to quantify physiological and molecular responses; (2) hypercarbia avoidance challenge to compare CO2 agitation and avoidance responses; and (3) swim performance challenge to quantify burst swimming performance. Acclimation to 31 mg L−1 CO2 resulted in a significant constitutive upregulation of c-fos expression in erythrocytes, combined with significant constitutive expression of hsp70 in both gill and erythrocytes, relative to controls. Largemouth bass acclimated to elevated CO2 also had a reduced glucose response (relative to controls) following an acute CO2 exposure, indicating a reduced stress response to CO2 stressors. In addition, largemouth bass acclimated to elevated CO2 conditions required 50 % higher CO2 concentrations to illicit agitation behaviors and displayed prolonged burst swimming abilities in high CO2 environments relative to controls. Together, results demonstrate that largemouth bass exposed to chronic hypercarbia may possess a physiological advantage during periods of elevated CO2 relative to naïve fish, which may permit increased performance in hypercarbia. This work was supported by the Illinois Department of Natural Resources through funds provided by the USEPA’s Great Lakes Restoration Initiative (GLRI). Partial funding was also provided by the USFWS Federal Aid in Sport Fish Restoration Project F-69-R. We would like to thank Greg King and Jennifer Shen for field and laboratory assistance. Dr. Zachary A. Cheviron and Dr. Anthony C. Yannarell provided excellent comments on this manuscript. All work performed in this study conformed to the guidelines established by the Institutional Animal Care and Use Committee (IACUC) of the University of Illinois (Protocol # 13123).